This delightful novella describes how the Queen of England accidentally develops a love for reading. She happens to come across the Westminster travelling library and borrows a book just to be polite. She returns the following week, and winds up hiring her fellow library user Norman, a kitchen boy, as a sort of reading guru. However, as her passion for books increases, she begins to resent the fact that her duties demand her to spend time away from her books. Her advisers become increasingly worried about the Queen’s new obsession, and begin to devise schemes to keep her from reading so much. 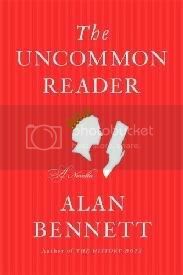 The Uncommon Reader really is a book for book lovers. I think most bookworms will identify with this book to some extent. And no, most of us don’t actually neglect our jobs so we can read, but let’s face it, how often do we want to? Plus the story is about so much more than just putting duties aside to spend time with a good book. It’s about all the joys and pleasures of reading, all the discoveries and disappointments, all the feelings it brings out in us, all the thoughts it makes us think. It’s also about the conflict between art and “real life”, about writing, about living, about doing things. And about politics, education and society at large. Do you ever wonder if reading actually counts as doing something? My own opinion is that reading is very much an active process, but as she progresses in her reading the Queen begins to ask herself that question. This brings her to writing. I know that writing down my thoughts about what I read and discussing books with others are very big parts of what makes reading so rewarding for me. One thing that surprised me about The Uncommon Reader was how funny it is. I had read reviews that said it was funny, but somehow I didn’t expect it to be quite this funny. It’s funny in a subtle, straight-faced sort of way, but very funny nonetheless. The appeal of reading, she thought, lay in its indifference: there was something undefering about literature. Books did not care who was reading them or whether one read them or not. All readers were equal, herself included. Literature, she thought, is a commonwealth; letters a republic. Authors, she soon decided, were probably best met within the pages of their novels, and were as much creatures of the reader’s imagination as the characters in their books. And seeing the blue- and pink-jacketed volumes ranged along her desk, the Queen thought they looked almost edible and straight out of a patisserie window. I loved this book too! I just hated for it to end. Thanks for the link. It's a gem of a book. I loved it and wrote about it here. I'd really like to read this now - thanks. I haven't read this yet but I too have seen nothing but good reviews of it and yours is another one. Guess I'll have to look into it one day soon. I would just love to read this. I keep seeing more and more positive reviews. I love it when a book can make me laugh. great review! I like the quote about books. I've read about half of those other blog reviews lol. I think this sounds like such a good book but not something on my immediate list so far. I'm glad you liked it. It is such a great book! I have just this very moment finished this lovely little book! I read a library copy and found that I wanted to highlight and underline so much, that I will definitely purchase this book for my own personal library. Your review was wonderful and summarized my thoughts exactly! Nymeth, I read this book last year and loved it from beginning to end. Your review said it all. You captured the book's essence and it makes me want to read it again. I found myself laughing out loud at the Queen. In fact, the passages you quoted were some of my favorites!! Oh, how I loved this book! You've highlighted some of my favourite quotes, too. I think I need to read this book! The quotes you included definitely back up your statement that "most booklovers will identify with this book to some extent." I'll have to start looking for it at the half price bookstores around my house! I SO want to read this book! And neglecting jobs for reading? Sometimes I wish (Laura--don't tell!!). I don't know how many times I've said to my coworkers, "Can I please just crawl under my desk and read the rest the day??" I'll definitely have to move this one up on the list. I totally agree that this is a book for readers! Glad you enjoyed it too! Oh you have given me one more book to add to my wishlist. I'll have to search for this one. Great review. I just got this on audio and am looking forward to it! Glad to see that you enjoyed it! I think this is the first review I've ever really read of this. It sounds like such a lovely little book. I love the quotes that you posted, and I really want to read this one now. Mine is http://bkclubcare.wordpress.com/2008/04/08/the-uncommon-reader/ . GoogleBlogger doesn't seem to like my link so I'm typing it out here. Sigh. I wanted to love this book so much. Maybe my expectations were too high. Can we still be friends? I am looking forward to reading this one. It sounds so good. I am glad you enjoyed it, Nymeth. Bermudaonion: I wish it had been longer too! BooksPlease: Thanks for the link! I added it now. Dar and Charley: I think you'll both enjoy it. Ladytink: It's actually different from what I normally read too but I was so glad I picked it up. Molly: I'm so glad you enjoyed it as much as I did! Melody: I do too! I never tire of them. Staci, thank you! I'm glad to hear you enjoyed it too. Laura, I hope you find it! Em, I'm glad to hear you did! Chris: I wish it had been longer too! Sorry to heat you were stuck at work :( Old Man's War does sound awesome! Violet, I hope you manage to find it! Deslily: Indeed it does! It's so nice to find a book you read fast but that is still as satisfying as this. Joanna, I look forward to comparing notes with you! Care: Thank you! Google Reader tends to not find posts that are more than a couple of months old for whatever reason. This is another one of my choices for the Dewey's Books Challenge. I'm really looking forward to it. I haven't read this yet but it's on my list. It just sounds so fun. Coming kind of late to the comments here, but I'll leave one nonetheless. I've seen so many reviews of this book, I'll just have to put it on my list now! I didn't realize how much I'd love books about reading until I opened Nick Hornby's compilations. Now I've got a dozen such books on my list, and this one will topple the pile! I'm working right now, and you can imagine how much I'd like to throw my computer out the window and read instead. LOL I've heard nothing but good things about this one. I can't wait to read it! Great review! softdrink: I really hope you enjoy it! Jeane: It's never late! Nick Hornby opened my eyes to the whole books-about-books universe too. Anna: I can imagine indeed, lol. Iliana: I know just what you mean. I hope you enjoy it! Glad you enjoyed it, it is a gem of a book! sounds delightful. Another for the wishlist! this is a book I will forever link to Dewey and her recommendation that was absolutely stellar. I have this on the TBR list and I hope to get to it soon. This was a funny little book! I consider reading "active" also. I do know people, though, who will rarely allow themselves to read because they think they are doing nothing or wasting time. I liked the quote about authors being better met in their books! I have met some very nice authors, but there have been a few that are fantastic writers that I wished I'd not met!